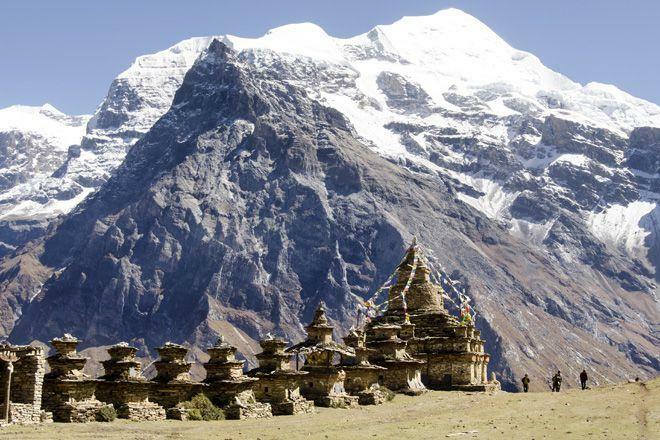 Wherever you trek in the Himalaya – on the Annapurna Circuit, trekking to Everest Base Camp or on a Mera Peak trek – you will encounter chortens (also known as stupas). These iconic Buddhist structures are seen all over Asia, from glorious golden chortens in important city-centre temple complexes to small ones, slightly battered by the elements, sitting alongside remote mountain trails. Like mani stones and prayer flags, chortens will no doubt feature prominently in your memories of the region. We know that many people are curious about their purpose and meaning – read on to find out a little about these fascinating structures. In the mountains they are often simple structures, placed alongside trails, on high points, or at spiritually significant locations. On the Mera Peak trek, for instance, chortens often mark the cols (mountain passes). Often they are strung with prayer flags and can have mani stones placed nearby, and even in the remotest places trekkers might find the remains of small offerings made by passing traders and pilgrims. However, despite their occasionally worn-down appearance, these small mountain chortens serve the same purpose as the ones found at the beginning of Mera Peak treks in places like Kathmandu. Chortens originate from the original stupas of India which housed the relics of the Buddha; nowadays, some contain important relics, but they all hold offerings and prayers. They are a religious focal point in the landscape, and are believed to have a positive effect on the people who live nearby or pass through the area. Building a chorten is an especially karmic act, helping to ensure fortunate rebirths. During the construction process, the offerings are fixed inside the chorten. Offerings include mantras written on paper, jewellery, and other precious objects – although it is more important to simply make an offering than to ensure the item is expensive. Another vital component of the chorten's interior is the Tree of Life - a wooden pole covered with gems and thousands of mantras. It is placed in the centre of the chorten during a ceremony, where participants hold colourful ribbons attached to the Tree of Life and make their most positive and powerful wishes, thereby storing energy in the chorten and allowing it to function. The chorten is then completed, which in Nepal typically includes the eyes painted near the top. These represent the Buddha's eyes. Whether in bustling Kathmandu or high in the mountains on a Mera Peak trek, they look out in four directions, signifying the all-seeing nature of Buddha.